Mathew: This is a difficult film to review. Helm: Take your time, Valhalladrim. Let it out. Mathew: I just... I mean... Where do I even start? Helm: Start at the beginning, Mathew. Helm: And how did this make you feel? Mathew: I... I... I'm devastated. I mean, I enjoyed The Hobbit movie on an emotional level, I guess, and I get that Peter was working hard to turn a single book into three movies, and I get that he was trying to tie the whole thing together with the Lord of the Rings trilogy... I get all of that... but The Hobbit is sacred. You can't just mess with it to make it fit the LOTR movies better. So, there's a certain amount of outrage... a feeling of betrayal. I guess... I don't know... I'm devastated. Helm: There there. Of course you are, you stupid thimblewit. Helm: You are an idiot. You are devastated by the fact that Peter Jackson played with the story in order to better mesh it with his Lord of the Rings films? Devastated because the original text should remain sacred?! Helm: Do you know that your precious J.R.R. Tolkien himself changed the story twice after its publication to make it better mesh with the Lord of the Rings Books? Helm: He did. In the first edition, which I read in the beginning of October of 1937, Gollum bets Bilbo the Ring as the prize in their riddle competition. And when he loses, he simply gives it to the hobbit and the two part ways amicably. Mathew: No! He wouldn't! It's the One Ring! The Ring of Power! Helm: Not when Tolkien first wrote The Hobbit it was not. It was just a simple magic ring. It was only after he had conceived of the Lord of the Rings that he adjusted both the power of the ring and the personality of Gollum. Mathew: OH MY GOD! Stop it! Helm: And in that same first edition, Tolkien says that the Elves were also called... Gnomes. Helm: Yes. You see, Mathew, Tolkien understood something that you apparently do not. The Hobbit is a STORY. He made it up. It is not real. Consequently, alterations to it are not a sin. Helm: The Hobbit, as delightful as it is, is just a book, and The Hobbit: An Unexpected Journey is just a movie. Mathew: You shut your mouth! Helm: Alas, you weak-minded nitwit, 'tis only too true. You go ahead and weep whilst I review this film for our audience. 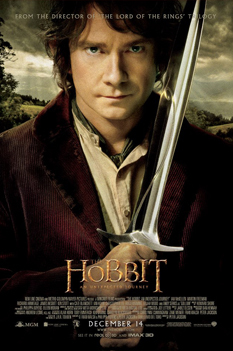 Dear readers, I did, for the most part, enjoy this first installment of The Hobbit. Verily, there were some places that did drag, particularly during the sequence when Bilbo first meets the dwarves and everyone sits around talking and singing. There were some changes to the story that I found surprising and even one I thought was uncalled for. But, for the most part, the film moved along nimbly for such a behemoth and the bulk of the changes seemed in character with the kind of changes Tolkien himself made to The Hobbit when connecting it to the Lord of the Rings or were drawn directly from expanded material he himself wrote. Helm: Please keep in mind that if you do not like fantasy epics, you should probably avoid this film. Further, there are some slight tonal problems that arise from the attempt to transform a children's fairy tale into a darker work of adult fantasy. Also, do not imbibe over much of the soda during the previews. Mathew nearly burst his bladder and wet his seat.